December 1st is approaching quickly, and so is the first Health Research Infrastructure (Health-RI) Conference that will be held in Amersfoort, The Netherlands. This one-day Health-RI conference is a unique opportunity to discuss developments in the creation of a Dutch nationwide Personalized Medicine & Personalized Health Research Infrastructure by connecting biobank research facilities and data collections. Keynote speakers Ain Aaviksoo, MD MPH, Deputy Secretary General for E-services and Innovation at the Ministry of Social Affairs in Estonia, and René Bernards, Professor of Molecular Carcinogenesis, Netherlands Cancer Institute (NKI) will elaborate on the societal and scientific perspectives of how we can build and utilize a functional infrastructure for personalized medicine and health research. Visit www.health-ri.nl for the program, list of speakers, abstracts and CVs. You can still register to join inspiring sessions and take full advantage of the Q&A slots, sessions, lunch and coffee breaks, demos and poster sessions to discuss your ideas and needs related to personalized medicine & health research infrastructure. 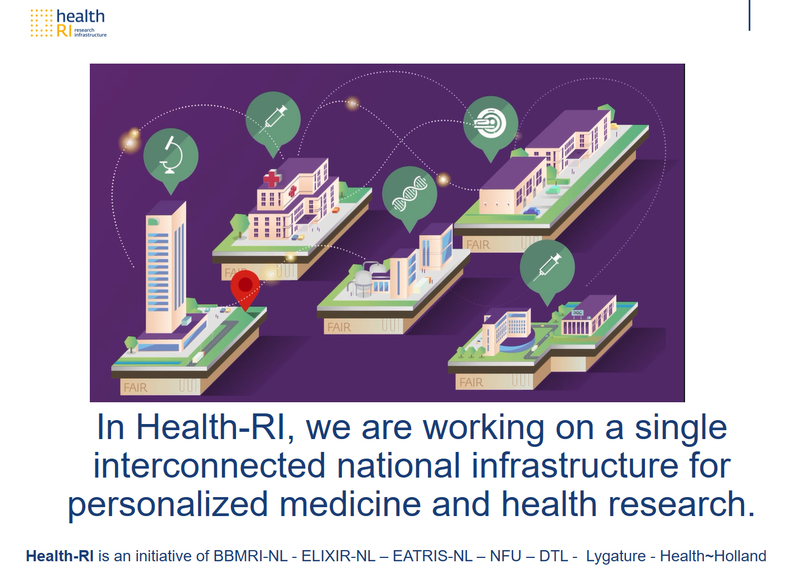 Health-RI is a collaborative initiative of the Netherlands’ existing large-scale biomedical research infrastructures BBMRI-NL, ELIXIR-NL and EATRIS-NL, and the Netherlands Federation of University Medical Centres (NFU), Dutch Techcentre for Life Sciences (DTL), Lygature and Health~Holland. This conference is co-organized with FMS and FHI. For more information, contact Marjoke Kortas, communications manager BBMRI-NL or watch the Health-RI video.